As one of the most powerful and most functional messaging applications, WeChat is very popular among users. But sometimes, you can delete some important WeChat messages that were not included in a backup and hence can't be recovered. In this article, we are going to show you how to recover WeChat Messages even without a backup. The methods also supports the iPhone, iPad, iPod touch running iOS 12. 1. Is it Possible to Recover Deleted WeChat Messages? 1. Is it Possible to Recover Deleted WeChat Messages from iPhone? Contrary to popular belief, it is actually possible to directly recover deleted WeChat messages from your iPhone. The iPhone saves data on a database known as SQLite. When you delete data, the database changes the data from "Allocated" to "Unallocated" but the data isn't really deleted. When you add data on to the device a while later, it occupies the "Unallocated" data, thereby overwriting the data that was there. It is still possible to recover the data in the "Unallocated" space with the help of a third-party iPhone data recovery software that can access the SQLite database. 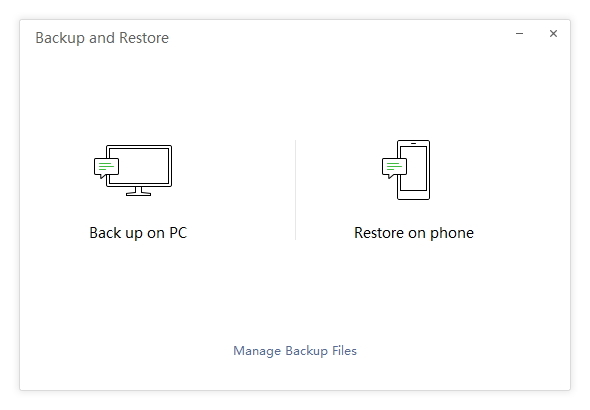 If you have made backup using iTunes, iCloud or WeChat for Windows or for Mac before, you could restore your device from the backup file. It is also important to note that iCloud and iTunes backups may erase the current content on your iPhone. To avoid this, you could take good advantage of a data recovery tool to view both the existing and deleted WeChat data and recover without erasing iPhone. It is also just as important to refrain from using your iPhone when you're trying to recover data. Any new data generated may overwrite the data you are trying to retrieve, making it unrecoverable. Support to directly recover Wechat messages without backup. Enable you to preview and check both deleted and existing WeChat messages before recovery. Can also extract Wechat data from iTunes/iCloud backup and recover to computer. No need to restore your device to get Wechat messages back. Also support to recover 22+ file types from iPhone without backup like photos, videos, text messages, contacts, safari history, WhatsApp messages, WeChat messages etc. Supports iPhone, iPad and iPod touch running iOS 12/11/10/9/8/7. Easy operations and high recovery rate. Whether you have backed up the iPhone with iTunes or iCloud, you can do so by using iMyFone D-Back. See how to do it. Download the software and launch it. 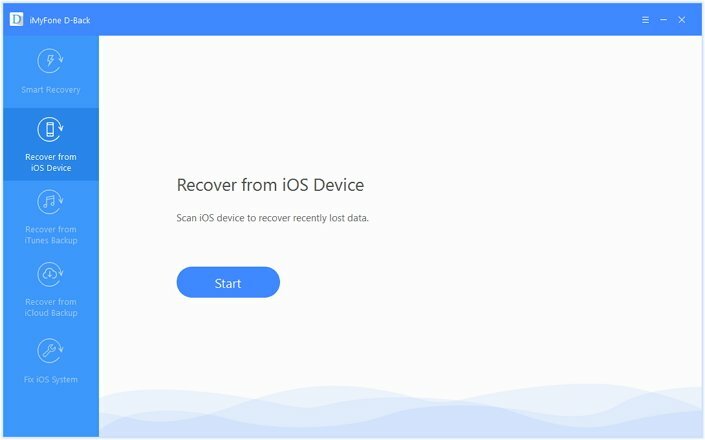 Select "Recover from iOS Device" tab. Initiate the process by clicking the "Start" button. Connect your device using the USB cable. Once iMyFone D-Back detects your iPhone, click the "Next" button. On the next window, select the data you want to retrieve, in this case WeChat and then click "Scan". It will start to scan your iPhone deeply. Once the program completes the scan, preview the results to confirm the files you wish to recover and then click on "Recover" to save them. A small dialogue opens up asking to choose saving location. Select a folder on the computer to begin recovering and saving the files. And voila! WeChat history recovery on iPhone is completed! Please ensure that your iPhone can be recognized by the computer if you want to recover WeChat messages without backup. iMyFone D-Back supports to detect messages from multiple WeChat accounts. If you want to recover WeChat messages from iTunes or iCloud backup files, just choose "Recover from iTunes backup" and "Recover from iCloud backup" modes. The steps are similar as recovery without backup process. iMyFone D-Back is a paid software with a free trial version. You can download the free trial of iMyFone D-Back Win/Mac to find the lost/deleted WeChat messages on your iPhone. If you have a iTunes backup including the deleted WeChat messages, the following is how to restore the iPhone to get the deleted WeChat messages back. Step 1: Launch iTunes on your computer and then connect the iPhone to the computer using USB cable. Step 2: Select the iPhone when it appears in iTunes and then click "Restore Backup." Step 3: Choose the most relevant backup by looking at the date and size. Step 4: Click "Restore" and then wait for the process to be completed. Keep the device connected through the process until it syncs with your computer. You can easily get your WeChat back on your iPhone after the restore process. You need to make sure you have an available iTunes backup before restoring. All the current settings and data on your iPhone will be erased. You can't preview the data before restoring. The device will revert back to the condition it was when you backed it up. All data created after the backup will be lost and can never be recovered. Your WeChat messages can also be backed up in iCloud. 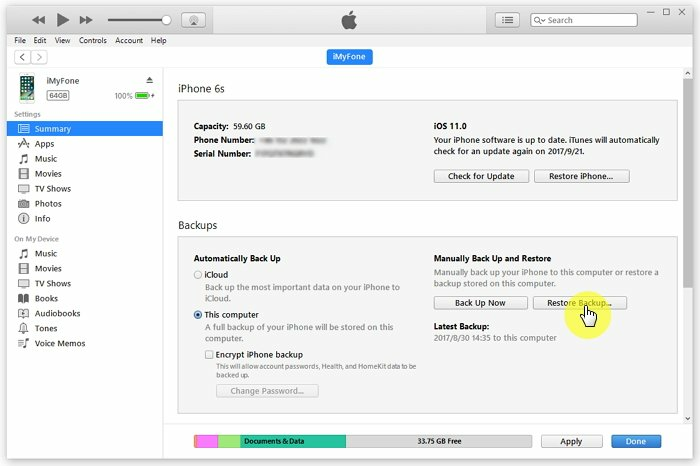 If you have turned on automatic iCloud backup, you can use this method to restore the backup and get your messages back. Step 2: If you are using iOS 10.3 or higher, tap on Your Apple Profile. If you are using iOS 10.2 or earlier, tap on iCloud. Step 3: For iOS 10.3, tap on iCloud and then tap on the graph showing your iCloud usage, then tap on Manage. For iOS 11, tap iCloud > Manage Storage > Backup. For iOS 10.2 or earlier, tap on Storage > Manage Storage. Once you are certain you have a backup, follow these simple steps to restore the backup. Step 1: To begin, you need to erase all contents and settings from your device. To do that go to Settings > General > Reset > Erase All Contents and Settings. Step 2: This will bring you to the set-up or Hello Screen. Follow the onscreen set-up steps until you get to the "Apps & Data" screen. Here, choose "Restore from iCloud Backup." Step 3: Sign in to iCloud and then choose the most relevant backup. You may be requested to sign in to your Apple ID account to restore apps and purchases. Step 4: Keep the device connected to a Wi-Fi network until the progress bar appears and completes. The restore process is free to access and use. You will easily get your WeChat messages back on the iPhone. You need to ensure you have an iCloud backup available for the process to work. You can't preview the data on the iCloud backup. Your current settings will be erased. 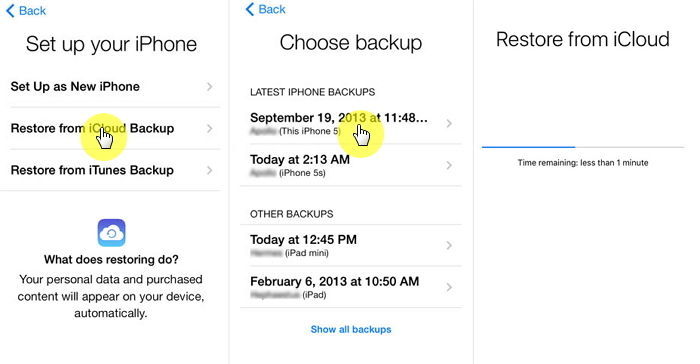 Your iPhone will revert back to the status it was in when you created the backup. This means you will lose any new data added to the device after the backup. You may not be able to backup all the data on your iPhone if the iCloud storage plan you have is insufficient. 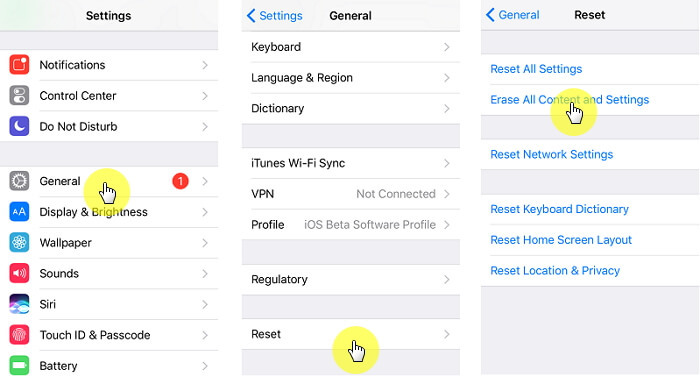 If you only want to restore WeChat data instead of restoring your iPhone, here is a tool that can help you. It is a tool that allows you to restore individual app data such as WeChat data from your iCloud backup or iTunes backup to your device. The WeChat messages on your device can be merged with the data in your backup and the other data on your device will not be affected. You can also preview the WeChat messages before restoring. It is called iMyFone iTransor iPhone backup and restore tool (iOS 12 supported). It also offers free trial version. If you had backed up your WeChat Data using WeChat for Windows or Mac, you can easily restore the device from this backup to get the WeChat data back. Here's how. Step 1: Open WeChat for Windows or Mac on your computer. Make sure that the iPhone and the computer are connected to the same Wi-Fi network. Step 2: Tap on the icon on the lower-left corner and then choose "Backup and Restore"
Step 3: Choose "Restore on iPhone" to restore the backup to the iPhone. 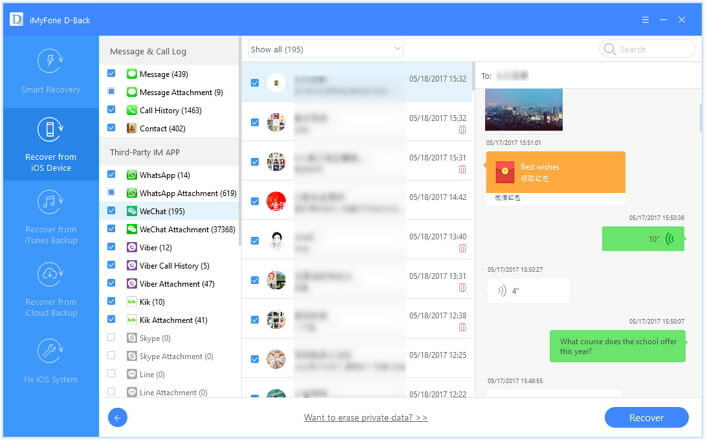 It is a good alternative as long as you have a backup of your WeChat messages on WeChat for Windows and Mac. You current WeChat history will not be affected by the restore process. All messages will be merged with the backed-up history. You need to backup Wechat on PC/Mac first. WeChat is the largest Standalone messaging app by a number of monthly active users. Unlike other apps, WeChat can save messages to the device. Users will lose the data when they change their mobile phone. However, overcoming this problem is possible. 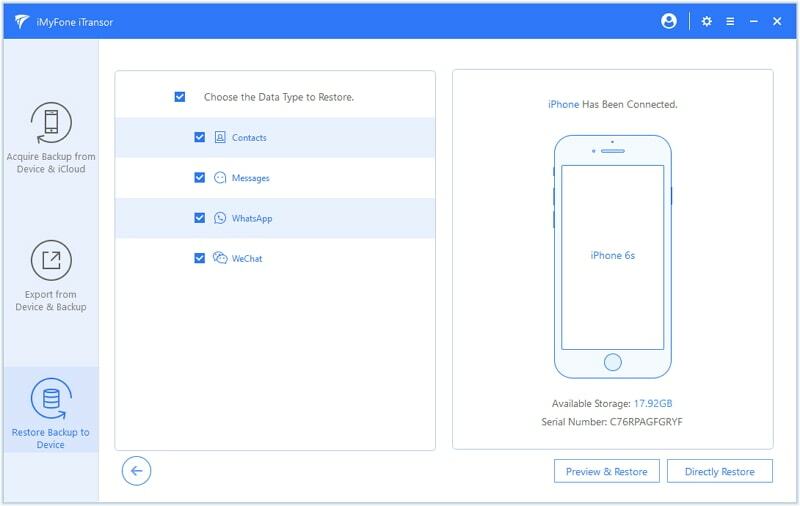 You can try the iPhone backup & restore tool mentioned above - iMyFone iTransor (compatible with iOS 12) to transfer WeChat messages to computer in HTML or CSV formats or backup the WeChat database to computer and restore to device later. Follow these simple steps to transfer WeChat History from an iPhone to another device. Before you do, ensure that you have created a backup. Connect both devices to the same Wi-Fi network and then sign in to the same WeChat account on both devices. Step 1: Sign into the WeChat account on your existing iPhone and head to the "Me" tab. Step 2: Tap the "Settings" button as shown above. From the window, select "General" tab. Step 3: Tap the "Chat Log Migration" button and then click on the "Select Chat Transcript" button. Step 4: Log in to this account on the other phone and scan the QR code in the interface. As soon as the QR code scanning is complete, the migration process begins. 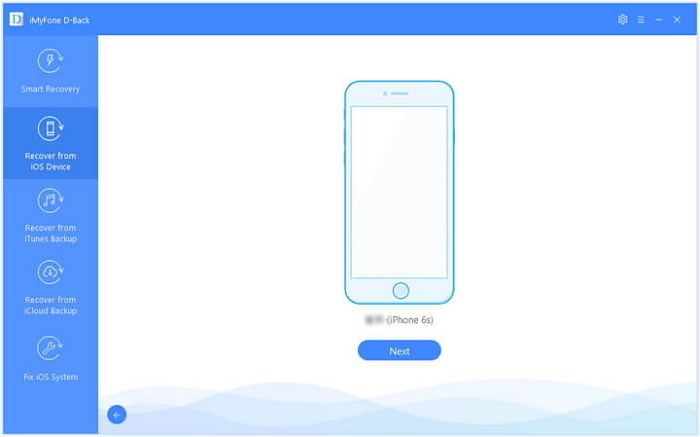 Step 5: Once the process is complete, you will have all the WeChat data transferred to your new phone from the old iPhone device. Step 1: Download WeChat for Windows on your PC. After installing, log into your account. Use the WeChat app on your iPhone to scan the QR code. Once authorized, you can also chat with your friends from your computer. Step 2: To create a backup of the chat history for the desktop version, connect your iPhone to the computer first. Step 3: Click the "More" icon from the WeChat window and then tap on the "Backup and Restore" tab. Step 4: Click "Back up on PC" button to save the messages to the computer. So this article has shared how to recover deleted/lost Wechat messages on iPhone and also how to backup Wechat in case of future loss. In a word, if you didn't make the backup and need to selectively recover Wechat, using iMyFone D-Back is the best choice, and if there are backup files, you can restore from either iTunes/iCloud backup. If you have any better solutions, kindly leave a message below to help more people. Hi buddy! You did a excellent job on this! I know that wechat users are not so many and few tool can recover it but you did it! good! Thank you so much for your feedback, have a nice day! I’m a total noob and need some help. My boyfriend wants to recover messages and pics from WeChat conversations from a few years ago. He doesn’t have access to that iPhone anymore, though. Can he use any of this to retrieve them somehow online, from WeChat cloud storage or something? Hello Mychala, thanks for your question. Wechat doesn’t have a cloud storage and the chat messages are stored on your local device. Has your boyfriend made any iTunes or iCloud backup before? If yes, you can let him try “recover from iTunes backup” or “recover from iCloud backup” modes to scan backup file and preview wechat messages, without access to that iPhone. Will it restore all history even I’ve cleared it from my iPhone? If yes; will it recover all of it or partially? I recently purchased this software and attempted to backup my WeChat history. However, I wasn’t able to find my chat logs in the recovered files. Am I missing something, or is it just saved in a format my computer doesn’t know to read?